If you give birth in a hospital, chances are you trust the advice of your healthcare professionals. That often includes what baby needs right after birth, and parents often don’t know that they can take part in these decisions. New research is changing one protocol that has been practiced for decades – and it has amazing benefits for both Mom and baby. It has often been the practice of hospitals to whisk a newborn baby away shortly after birth to give them their first bath. Then baby would be swaddled and returned to Mom to begin the bonding process and for their first feeding. But several research studies have now proven that delaying baby’s first bath – from 12 to 24 hours after birth – can make a huge difference in their health. One study published in January in the Journal of Obstetric, Gynecologic, and Neonatal Nursing included almost a thousand mom-and-newborn pairs. Half of the newborns were given their first bath shortly after birth, while the others didn’t receive their baths for up to twelve hours. Rates for exclusive breastfeeding and the vitals of the newborns were as much as ten percent greater in the babies who were not rushed off for their first bath! A striking aspect of the studies show that delaying a newborn’s first bath improves breastfeeding success. It was also found that these mothers were more likely to continue to exclusively breastfeed when they went home with baby. Pretty impressive. Of course, it would make sense that this would allow for Mom and baby to have more time for skin-to-skin contact and allow them to breastfeed right away without interruption. It takes time for both mother and baby to get the hang of breastfeeding, and it can often be a struggle for baby to properly latch on when they are tired from the birthing process. Doctors and nurses have found that when a newborn is able to latch on to breastfeed within the first half-hour after birth, nursing becomes much easier. What’s the basis of this idea? Babies in utero are constantly sucking and taking in amniotic fluid, but after they take their first breaths outside the womb, they begin to forget this sucking and swallowing action. It then takes more time to re-learn this if breastfeeding is delayed. But if baby is able to latch on right after birth, they still remember the familiar process and research has shown it improves the long-term success rate of breastfeeding. After all, struggling for hours to get a baby to nurse can cause many moms to give up too quickly on the idea and turn to a bottle in the hospital. Delaying any interruption between mother and baby also improves breastfeeding success by extending the all-important skin-to-skin contact. Often baby will search out the breast when placed on mom’s chest and start nursing on their own. As if making it easier to breastfeed wasn’t enough reason, holding off on baby’s first bath has been found to have many other incredible benefits! 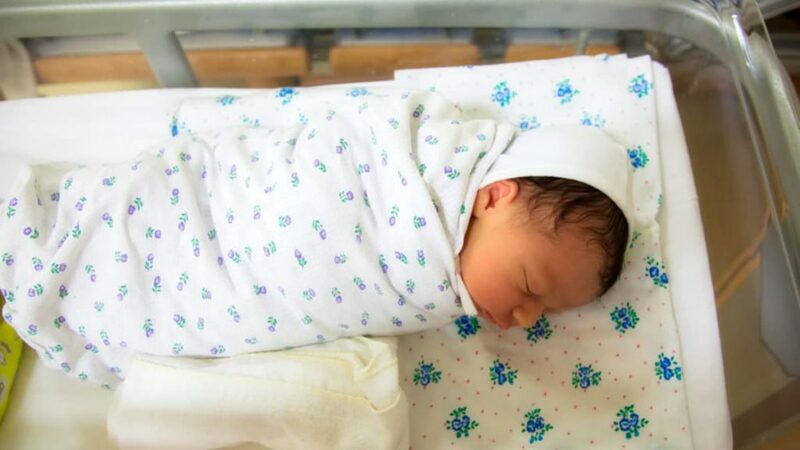 By swaddling the baby and allowing the vernix coating to remain on their skin for a time, studies have found that newborns have a much better chance at fighting off infections as they adjust to life outside the womb. This can be as simple as preventing their skin from becoming too dry to helping protect them from serious infections like Group B Strep, E.coli, and even meningitis. It also helps to keep them a bit warmer after transitioning from the warmth of mom’s womb to our typical room temperatures – often a drop of twenty degrees or more. If a newborn expends too much energy trying to keep warm, it will lead to stress and even a drop in their blood sugar. This can have the dangerous effect of making baby too sleepy to nurse and increases risk of infection. The baby’s temperature can also stay more stable with extended skin-to-skin contact. Apart from checking vitals and making sure baby is healthy, doctors are now recommending that moms hold their new little ones for at least a few hours before they go off to the nursery. So something as simple as delaying baby’s first bath can help to regulate their temperature, prevent infection, encourage bonding, reduce stress on the baby as they adjust to their new environment, and make breastfeeding more successful. Another new protocol that hospitals are testing out in regard to baby’s first bath are allowing mom to be wheeled into the nursery while holding her newborn and being able to participate in giving baby their first bath – another great idea to increase bonding. Delayed bathing is still not the protocol in many hospitals, however, but here’s the good news: Parents can speak to their doctors at their prenatal visits and request delayed bathing as part of their birth plan. As long as baby has no complications or need for medical intervention, there is no reason to deny the request. What could be better than giving a newborn such a head-start in life? What do you think of all the amazing benefits of delaying a newborn’s first bath? If you’re expecting, do you plan to request this as part of your birth plan? Leave us your thoughts.